Engineers: Arjen van der Schoot, Bert van der Wolf, Fir Suidema. Recorded on: May 23, 2006. 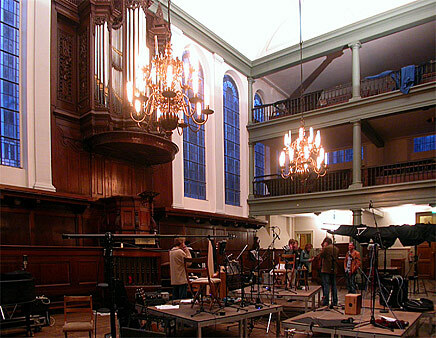 This church was the location of choice for the tracking of an album project by Californian band Venice and engineer/producer extraordinare Bert van de Wolf. The recordings were produced using Bert's gear: Pyramix recording software and hardware connected to dCS converters and Sonodore Microphones. The sweep signal was played back via an Avalon monitor. The location is stunning for music, a wooden interior of ideal proportions with a somewhat muffled but very open and spacious ambiance. This impulse response should be among anyone's favourites to date. A dead-silent location in the very heart of Amsterdam this delightful church from 1639 has seen many recording sessions so far, and from the sound of it, it has not seen the last yet.